Late in July of this year, I was found to have cancer in my brain. If you want to review the story, you can read an earlier posting about the details of my cancer treatment in the hospital. And you can read about an unexpected gift, Boomer. 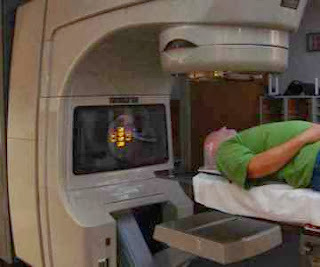 Since those postings, I have had six weeks of combined radiation and chemotherapy treatments. I was supposed to feel fatigue, and have an upset stomach. The radiation was supposed to cause a "sunburn" on the side of my face. I had none of those. Here's a common sermon illustration-- When a person goes to the altar to pray, she takes the burdens off of her shoulders, and prays to the Lord that He will take those burdens away. Then she gets up from the altar, picks up the burdens again, and carries them back out. It's fairly clear-- When a person asks God to take her burdens, she should leave them there, right? Right. Well, that illustration isn't totally accurate. What usually happens is a person takes his burdens to the altar, but never takes them off his own shoulders while he asks God to take them away. He prays while holding the burdens to himself! The Star Trek bridge device, shooting my head with X-rays. My head was held in place by a stiff plastic net. When I was taking the treatments, they were shooting through one of my brain's emotion centers with high powered X-rays. What I felt coming on was depression. Now, I understand what can cause depression, but I had none of those usual causes. So I knew that it was from the radiation. I passed this information to those praying for me, and I handed the whole thing over to God my Father. I told Him that I knew there was nothing I could do about it, and asked Him to get me through it. The result was that the depression passed that day. And each day through the treatments, my personal feelings of joy and satisfaction increased. At the end of the treatments, when I was supposed to be at my worst, I felt almost normal. Read 1 John 4.7-21. Right now, I'll focus on verses 18-19: "There is no fear in love, but perfect love casts out fear. For fear has to do with punishment, and whoever fears has not been perfected in love. We love because he first loved us." I had bypassed fear on all of this. When I could have been afraid, I had no emotions at all. I think that was God's gift, for His purposes. When they came back, the most powerful emotion I felt was the joy of knowing Jesus Christ and the love He had given to me. I know many, many Christians who have disease or injury, and have not been healed. Why is that, even though they love God? It's because they don't let go! Maybe he thinks he has to do something to earn healing. Maybe she wants to be healed, more than she loves the Lord. Maybe his heart is such that if he is healed, he'll wander off some other way. Maybe she thinks she loves God, but it's just an emotion of her own. Whatever the details, they don't truly let go of the burdens they are carrying. I also know Christians who have disease or injury, but are not bothered or afraid. They serve and love God and other people. They may or may not be healed in their lifetimes. But they aren't worried by that. They are powered by the love of Christ that lives and moves within them. How did I get through this so far? How can I face the possibility that the cancer could return, yet live with confidence that it is gone forever? Because I learned about that "perfect love" John talked about. Every person has love. But like everything else, it's not perfect. The only perfect love is the love of Jesus Christ, which He offers to every person as a gift. He did that by giving His life on the cross, for every person. I you don't have that perfect love, then run to the cross of Jesus Christ, and turn yourself completely over to Him. The love I feel for God, and the love I feel for everybody, is no longer my own love, but the love of Christ that was given to me. Because I have that love, I took these burdens off, handed them over to God my Father through the name and love of Jesus Christ, and walked away from them. Now free of those burdens, even though they could still exist physically, I am strengthened to serve and love God and other people completely, with the love of Jesus Christ. I have six months of chemotherapy coming. Not a problem.